GAZA GAZING AT US... SENDING OUT AN S.O.S. In the Gaza Strip there are three doors, one to the North-East (Erez Crossing), the other to the South-West (Rafah Crossing). One to Israel, the other to Egypt. 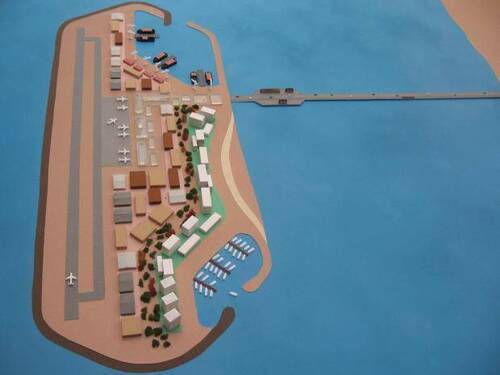 Plus the Kerem Shalom Crossing, for trucks only, 2 km South of Rafah. Today, as of early April 2018, the three doors are practically closed. Few people cross daily to Israel and back through Erez, due to security considerations between Israel and Gaza. None cross through Rafah to Egypt and back, except a few times a year, without any warning, leaving tens of thousands on waiting lists. When the Rafah Crossing was opened in February, hundreds of Palestinians, women, children, old people most of them, remained stranded on the Egyptian side for days on end, unallowed to come home. "We are being treated like animals" they complained. In the last months the number of trucks coming into Gaza from Israel has tragically fallen from 800/1,000 a day to 300-350. Not due to restrictive measures taken by Israel, but to the collapse of Gazans' purchasing power. People in Gaza just do not have the means anymore to buy what they need for basic daily life. Ten years ago, on January 2008, after 7 months of blockade, both by Israel and Egypt, the people of Gaza, under the guidance of activists who demolished the metal wall separating them from Egypt, desperately rushed to the other side. The United Nations observers estimated to half the population the number of those who crossed over for goods and supplies (between 700,000 and 800,000 then). After a few days though, then President Mubarak ordered the border to be sealed again, and they all had to return to what had become a cage to them. - "enable Gaza to open to the world"
- "release a significant group of women prisoners, sick prisoners, the youngest and longest-serving, along with those held under arbitrary procedures"
(among the prisoners was Sargeant Shalit who had been captured in a crossborder raid and detained underground, incommunicado, since June 2006). As they felt more leverage was needed, they extended this Campaign to the European Parliament - the only major forum worldwide directly related to Israel and Palestine, on every level : historical, geographical, spiritual, and human. Reaching up to 54% of the Members of Parliament in 2014. The release of Sargeant Shalit was obtained in October 2011, along with the release of 1,000 Palestinian prisoners and most of the women detained. Since, things have been stalling, and the human condition of the 2 million Gazans has gradually deteriorated to a point of no-return. Electricity can be switched on for 3 to 4 hours a day only. Families, businesses, hospitals, depend on generators - and their fuel, to be bought from Israel or Egypt. Strictly speaking, people live in the dark. Water from the taps is unfit to drink, and people have to buy water from barrels and bottles, which depletes their misery budget - 80% live in poverty, 65% under the poverty line, 45% of the people are unemployed (as opposed to 20% in the West Bank and 4.3% in Israel). For women and those under the age of 25, the figure rises to more than 60%, close to two thirds. The median age is 17. Half of the population is under 15. Although they could enjoy bathing along the Mediterranean shore, this has become a health hazard, as the water is tragically polluted from raw sewage rejected into it, due to electricity shortage. Even the beaches further North, in Israel, up to Ashkelon, are now polluted. What has changed since January 2008 ? Precious little. Things have only gone from bad to worse, from one Egyptian president to the next. There's no leaving the Gaza Strip, except through the Erez Crossing trickle to Israel, and the occasional and chaotic opening of the Rafah Crossing to Egypt for a short period, once a month at best. Activists and young men working for wages keep digging tunnels, deeper and deeper, often dying underground, buried alive in yellow sandy earth, crushed by collapses. Dozens have died this way. Egyptian and Israeli authorities keep flooding, destroying the tunnels, one after the other. Whereas there were once as many as a thousand, the tunnel business is nothing like what it was in the Mubarak-Morsi years. 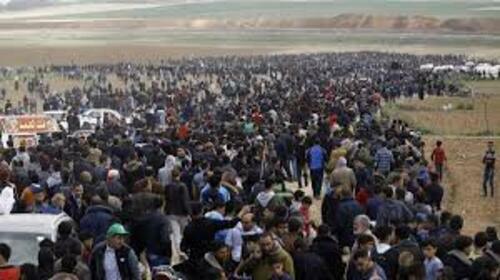 6- What of the "March of Return"? It can be seen as a ploy, a Trojan Horse of vast proportions, with an ultimate scheme of mayhem and bloodshed * - since bloodshed is the only element that may attract the world's attention. Close to 800,000 people desperately broke through the border with Egypt in 2008. This time the focus is on Israel, with the irreal goal of the 1948 refugees and their descendants (millions of them) returning to their former lands and homes. No Israeli government can ever yield to that. It would mean the implosion of the Jewish State, by the force of numbers and chaos. 1948 was 70 years ago. Where in the world do refugees return en masse after 70 years ? Add to this the number of military tunnels that have been dug from Gaza into Israel in the latter years, and you will understand that the Israelis have reasons to fear anything that could look like the Great Border Breach of 2008, this time into their land. Now, if you were Gazan, what would you do? Israeli citizen Leah Solomon asked. Since we are free to move and act as we please, whether in Europe, America, or the rest of the world, what can we do not to just sit back and pretend that we just don't see ? The very least that can be done is to reopen one of the two Gaza doors, the Rafah Crossing. All the more as no other than the European Union (Nobel Peace Laureate for 2012) has kept its keys since 2007. From 2005 to 2007, a remarkable team of 60 inspectors, the EU Border Assistance Mission - Rafah, did their job, letting an average of 1,500 Gazans cross daily. 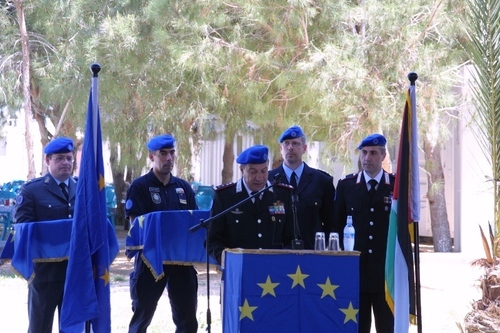 In the summer of 2007, these inspectors were sent back to Ashkelon, and later to the suburb of Tel Aviv, where they have been stationed since, at the cost of 1 million euros a year. Under the motive that "we don't talk to Hamas". "Hamas" couldn't have cared less. The people only paid the price. Since November 1, 2017 though, this pretext has lost its last shred of validity, since none other than the Palestinian Presidential Guard has seized control of the Rafah Crossing. In the current year, from July 2017 until the end of June 2018, the EUBAM - Rafah budget has been doubled to 1.98 million euros. What are they waiting for ? 8- Mach die Tür Auf ! Open that Door ! All we are asking is: let the EUBAM-Rafah Mission get back to work, and do its job. Mach die Tür Auf ! Open that Door ! Give Gaza a Fourth Door : to the World ! We, the European Union, the United States, the willing Emirates, Japan, Russia, China (why not? ), under the blue flag of the United Nations. Let the people of Gaza out ! 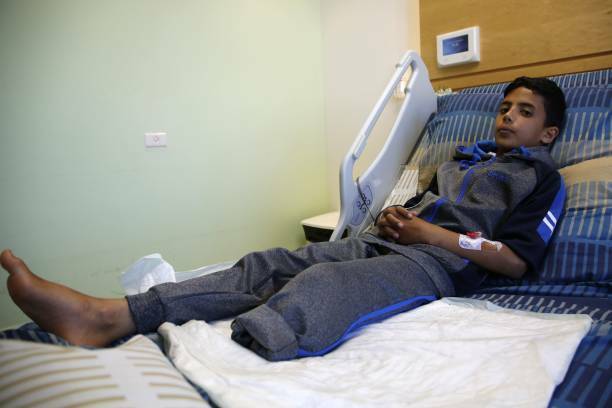 Abdel Rahman Nawfal, 12, sits in a hospital bed in the West Bank city of Ramallah on April 23, 2018, after his leg was amputated following an injury sustained after throwing stones at Israeli forces near the Gaza-Israel border. Friends of 15-year-old Palestinian Mohammed Ibrahim Ayoub, who was shot and killed by Israeli security forces during clashes along the Israel-Gaza border, hold up a poster of his portrait by his grave in a cemetery in Beit Lahia in the northern Gaza strip on April 21, 2018. 20. Hamas believes that no part of the land of Palestine shall be compromised or conceded, irrespective of the causes, the circumstances and the pressures and no matter how long the occupation lasts. Hamas rejects any alternative to the full and complete liberation of Palestine, from the river to the sea. 23. Resistance and jihad for the liberation of Palestine will remain a legitimate right, a duty and an honour for all the sons and daughters of our people and our Ummah. 25. Resisting the occupation with all means and methods is a legitimate right guaranteed by divine laws and by international norms and laws. At the heart of these lies armed resistance, which is regarded as the strategic choice for protecting the principles and the rights of the Palestinian people. 26. Hamas rejects any attempt to undermine the resistance and its arms. It also affirms the right of our people to develop the means and mechanisms of resistance. Managing resistance, in terms of escalation or de-escalation, or in terms of diversifying the means and methods, is an integral part of the process of managing the conflict and should not be at the expense of the principle of resistance. 30. Hamas stresses the necessity of building Palestinian national institutions on sound democratic principles, foremost among them are free and fair elections. Such process should be on the basis of national partnership and in accordance with a clear programme and a clear strategy that adhere to the rights, including the right of resistance, and which fulfil the aspirations of the Palestinian people. My name is Olfat al-Kurd. I live in Shuja'iya in Gaza. I am 37 years old and have four children. In July 2017, I joined the B’Tselem team as one of three field researchers in Gaza. In the past few weeks, since the protests along the fence with Israel began, we have been working around the clock to document, collect eyewitness accounts and testimonies of injured people, and gather information about the demonstrations and casualties. I attend the weekly protests not only in my professional capacity but also as a Gazan. Some of my photos, posted on B’Tselem’s photo blog, show how most of the protesters gather in tents pitched far from the fence. These families enjoy entertainment stages, live music, food stalls and other family activities. We go there to convey a political message, to demonstrate, but non-violently – we don’t go there with weapons. The soldiers shoot at us nonetheless, and people are injured from live fire and tear gas. This week, a concerned Israeli colleague asked me why I keep attending the protests, even though it’s dangerous. I replied that I am, of course, afraid, sometimes so much that I fear I won’t come back. But the truth is that nowhere in Gaza is safe – whether near the border or in our own homes. Israeli planes can bomb any house, anywhere, at any moment. We all live in constant dread of something terrible happening. Everyone in Gaza lost a relative in the last wars. I lost my brother in the 2009 war. The festival activities at the protests are a rare opportunity for us to breathe, meet people, and feel that we belong to something larger than ourselves. 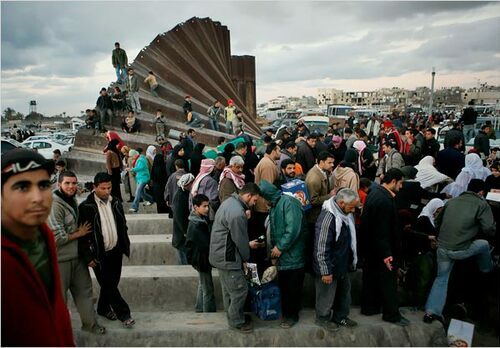 The open areas near the fence are the vastest in Gaza, but no one has dared go there since the last war. We can’t go to the beach any longer because sewage infrastructure has collapsed as a result of the blockade, and raw sewage flows into the sea. Many Gazans live in abject poverty and cannot afford to sit in a café or a restaurant, so they come to the protests with a coffee thermos and food. Israel has been holding Gaza under blockade for more than ten years. Some of the young people participating in the protests and being wounded or even killed by soldiers, do not know what it’s like to have running water and a steady supply of electricity. They have never left Gaza and grew up in a prison. You can’t visit us, Israel doesn’t allow anyone to see what’s going on here. There is no real life in Gaza. The whole place is clinically dead. The younger generations are crushed by the hopelessness and death everywhere. The protests have given us all a spark of hope. They are our attempt to cry out to the world that it must wake up, that there are people here fighting for their most basic rights, which they are entitled to fulfill. We deserve to live, too. Mr. Shammalah is the executive director of the General Union of Cultural Centers in Gaza. 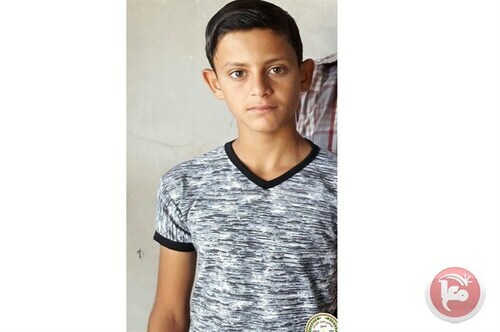 KHAN YOUNIS, Gaza Strip — Early in the morning on March 30, my 7-year-old son, Ali, saw me preparing to leave the house. This was unusual for our Friday routine. The Great Return March is the name that has been given to 45 days of protest along the border between Gaza and Israel. It began on March 30, Land Day, which commemorates the 1976 killings of six Palestinians inside Israel who had been protesting land confiscations, and ends on May 15, the 70th anniversary of the Nakba, the mass displacement of Palestinians during the 1948 war that lead to the creation of Israel. “Can I come with you?” Ali pleaded. I told him it was too dangerous. If Israeli military warnings were any indication, the risk that unarmed protesters might be shot by Israeli snipers was too high. “Why are you going if you might get killed?” Ali pressed me. His question stayed with me as I went to the border encampment in eastern Khan Younis, the southern Gaza town where I live. It remained with me on the following Fridays as I continued to participate in the march activities, and it lingers with me now. I cherish my life. I am the father of three precious children (Ali has a 4-year-old brother, Karam, and a newborn baby brother, Adam), and I’m married to a woman I consider my soul mate. 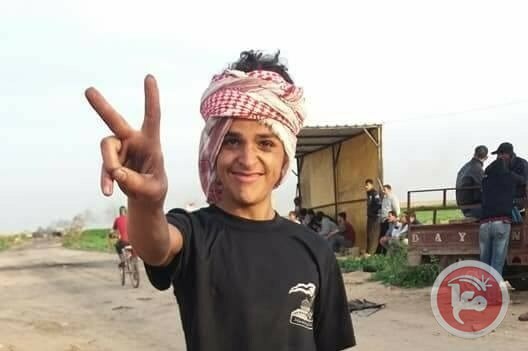 And my fears were borne out: 39 protesters have been killed since the march began, many by sniper fire, including a 15-year-old last week and two other children on April 6. Israel is refusing to return the bodies of two of those slain. Thousands more have been injured. Journalists have been targeted; 13 of them have been shot since the protests began, including Yasser Murtaja, a 30-year-old photographer, and 25-year-old Ahmed Abu Hussein, who died Wednesday of his injuries. So why am I willing to risk my life by joining the Great Return March? There are multiple answers to Ali’s question. I fully believe in the march’s tactics of unarmed, direct, civilian-led mass action. I have also been inspired by how the action has unified the Palestinian people in the politically fractured Gaza Strip. And the march is an effective way to highlight the unbearable living conditions facing residents of the Gaza Strip: four hours of electricity a day, the indignity of having our economy and borders under siege, the fear of having our homes shelled. Western media’s coverage of the Great Return March has focused on the images of young people hurling stones and burning tires. The Israeli military portrays the action as a violent provocation by Hamas, a claim that many analysts have blindly accepted. Those depictions are in direct contradiction with my experiences on the ground. 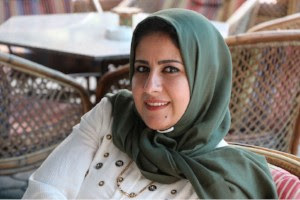 Representatives of the General Union of Cultural Centers, the nongovernmental organization for which I serve as executive director, participated in planning meetings for the march, which included voices from all segments of Gaza’s civil and political society. At the border, I haven’t seen a single Hamas flag, or Fatah banner, or poster for the Popular Front for the Liberation of Palestine, for that matter — paraphernalia that have been widespread in virtually every other protest I have witnessed. Here, we have flown only one flag — the Palestinian flag. True, Hamas members are participating, as they are part of the Palestinian community. But that participation signals, perhaps, that they may be shifting away from an insistence on liberating Palestine through military means and are beginning to embrace popular, unarmed civil protest. But the Great Return March is not Hamas’s action. It is all of ours. And our action has been so much more than tires burning or young men throwing stones at soldiers stationed hundreds of meters away. The resistance in the encampments has been creative and beautiful. I danced the dabke, the Palestinian national dance, with other young men. I tasted samples of the traditional culinary specialties being prepared, such as msakhan (roasted chicken with onions, sumac and pine nuts) and maftool (a couscous dish). I sang traditional songs with fellow protesters and sat with elders who were sharing anecdotes about pre-1948 life in their native villages. Some Fridays, kites flew, and on others flags were hoisted on 80-foot poles to be clearly visible on the other side of the border. All this was taking place under the rifle sights of Israeli snipers stationed about 700 meters away. We were tense, we were fearful — indeed, I’ve been in the proximity of people getting shot and tear-gassed — but we were joyful. The singing, the dancing, the storytelling, the flags, the kites and the food are more than symbols of cultural heritage. They demonstrate — clearly, loudly, vibrantly and peacefully — that we exist, we will remain, we are humans deserving of dignity, and we have the right to return to our homes. I long to sleep under the olive trees of Bayt Daras, my native village. I want to show Ali, Karam and Adam the mosque that my grandfather prayed in. I want to live peacefully in my historic home with all my neighbors, be they Muslim, Christian, Jewish or atheist. 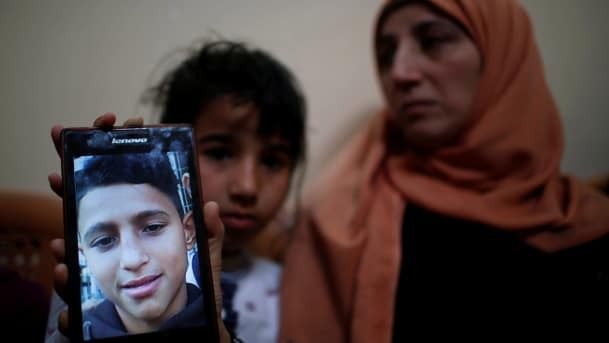 The people in Gaza have been living one tragedy after another: waves of mass displacement, life in squalid refugee camps, a captured economy, restricted access to fishing waters, a strangling siege and three wars in the past nine years. Israel assumed that once the generation who experienced the Nakba died, the youth would relinquish our dream of return. I believe this is partly why Israel keeps Gaza on the brink of humanitarian collapse — if our lives are reduced to a daily struggle for food, water, medicine and electricity, we won’t be able to think about larger aspirations. The march is proving that my generation has no intention of abandoning our people’s dreams. The Great Return March has kindled my optimism, but I am also realistic. Alone, the march will not end the siege and the occupation, address the huge power imbalance that exists between Israel and the Palestinians or right the historical wrongs. The work continues until everyone in the region can share equal rights. But I could not be more inspired by or proud of my people — seeing us united under one flag, with nearly unanimous acceptance of peaceful methods to call for our rights and insist on our humanity. Every Friday through May 15, I will continue to go to the encampments. I will go to send a message to the international community about the devastating conditions in which I am forced to raise my sons. I will go so that I can glimpse our lands — our trees — on the other side of the militarized border as Israeli soldiers surveil me through their weapons. If Ali asks me why I’m returning to the Great Return March despite the danger, I will tell him this: I love my life. But more than that, I love you, Karam and Adam. If risking my life means you and your brothers will have a chance to thrive, to have a future with dignity, to live in peace with all your neighbors, in your free country, then this is a risk I must take.